Sweet Living Magazine – launch issue! We’ve done it! 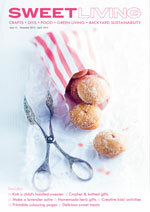 We’ve launched the first issue of Sweet Living. This is an online magazine with inspiring ideas and practical solutions for everyday living. It’s chock full of crafts, DIYs, recipes, readers’ tips for better living, backyard sustainability ideas and green living (natural cleaning solutions and the likes). We encourage readers to send in their money-saving tips for the home and garden. If you’re having trouble viewing from the link below, TRY VIEWING IT HERE. Sweet Living Issue 12 - out now! Just love the way you can click on photos and go straight to the website for more instructions or info! What a fantastic magazine! The layout is simply gorgeous and I love the great tips ! Will certainly be making the Christmas star cookies, and this afternoon I will kill my weeds with potato water! Love your new Mag and all the ideas well done. Will be making the snowman cookies sooo cute!! Love your mag, it’s just beautiful and full of great ideas! I stumbled onto your blog via Pininterest . What a beautiful magazine! What a wonderful online mag, so easy to browse and lots of great ideas and free downloads. Will email to all my friends! Beautifully laid out, a delight to read! Full of great ideas and tips…I just cant believe its FREE! Great job on the first issue, and I eagerly await the next. What an awesome magazine! Thank you so much for sharing all these wonderful ideas. I am really looking forward to the next issue! Some kind person pointed me towards Sweet Living Magazine this afternoon – I absolutely love it! Wow..thank you …I have just found a wonderful way to spend my day…looking through Sweet Living……packed full of useful articles…woo-hoo…innovative and inspiring…. Love the Magazine. Will make the Whole Strawberry jam….it looks delicious! Hi Shirley. The magazine is free to everyone online. The next issue is out mid February, so make sure you check back here then. Love your magazine will have to post about it on my Interior Design/lifestyle blog. Saw your ad on my facebook page. Thanks Lee. Would love for you to share it with your readers. Your blog is absolutely gorgeous! Just LOVE this on line magazine so much. What a lovely “homely” magazine and such beautiful thngs in it and ever so practical. Have subscribed to it. Am bit thick when it comes to computer skills but would like to print out a couple of recipes and not sure how to do it – have right clicked on the page but the print icon does not come up, can someone please enlighten this computer idiot how to do it. !!!!! To print the magazine, hit the print button at the bottom. When you hover your mouse on the pages, the print icon comes up at the bottom. Click that and it will take you to the Issuu site. You may need to register for the site, but it’s free. Once again, click the print icon at the bottom. It will ask you if you want to print all the pages (at this stage you can’t do it individually). Click yes. It doesn’t actually print – it downloads a pdf of the full magazine. From the pdf you can print the pages you wish. Thank you so very much. It is an amazing magazine. I do lots of crafts and love cooking so this magazine is awesome. Cant wait for future issues. What a wonderful magazine! Congratulations, I will definately be back for more fabulous ideas and inspiration, thank you. Not sure why that’s happened. Perhaps you could click on the image and try again. Or try this link here for issue 2 and this link here for the launch issue. The launch issue is still online for everyone to view. Congratulations on a much needed online mag . Well thought out with fabulous layout. Look forward to regular e-mails. Will definitely share this sight with all my friends.